Examine the life of almost any saint and you will be struck by how ordinary they all started. St. Francis of Assisi is an excellent example of this. As a young man, Francis indulged in parties, dreamed of glory in battle, and was pretty much just like the rest of the young men in his town. Had you known the teenage Francis, you would probably not have assumed he would one day be recognized as one of the great saints of the Church. No, more than likely, you would have thought his story had a different ending in store. It is clear, however, that in the life of Francis, a seed of faith had been planted. “The kingdom of God is as if a man should scatter seed upon the ground, and should sleep and rise night and day, and the seed should sprout and grow, he knows not how” (Mark 4:26-27). In this parable, Jesus is revealing something about the lives of the saints, and the life he is calling us to as well. Throughout our lives, God plants seeds. Often, these come in moments of encounter or conversion. Perhaps you have read a blog or heard a homily in which you knew the voice of the Lord was calling you. That was a moment of conversion. It was a seed thrown into your life. Perhaps as a youth, you attended a conference, and that weekend God may have shown you his face in the Eucharist. A seed of conversion was planted. The thing is, if you were operating under the assumption that those moments of encounter were somehow going to “make you a saint”, then it is possible that, instead of moving you forward on the road of sanctification, they may have left you feeling disillusioned. You might not have known that every incredible moment of encounter is followed by an ordinary moment of faith. It is easy to believe that mystical moments of conversion make saints. And, yes, there were those moments in Francis’ life, but no moment distinguishes itself as “the moment” in which he became a saint. He could have left his encounter with the leper feeling good about giving his money, about having hugged the man, and left self-satisfied and unchanged. But, he did not. Instead, he let that encounter set him down a path. It was a long and winding road that led to his sanctification. 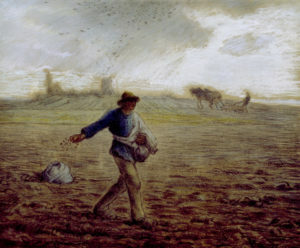 The sower had thrown the seed into his life but Francis, at any point, could have chosen to ignore it or to turn away from it. God revealed himself to Francis in those moments, but, far from controlling how Francis would move toward him, or even dictating whether he would seek him at all, God allowed the great saint to respond. It is not that Jesus does not know how the seed of faith grows in his people. What he is telling us is that, upon receiving this seed, we must choose to follow. Francis did just that. Night and day, the seed of faith sprouted and grew as Francis chased after the heart of God. What makes St. Francis extraordinary is not the dramatic stories. What makes him remarkable is the daily resolve to respond to the seed of faith that had been planted. The truth is, God is calling you to sainthood. He has planted the seed of faith in your life. It is very likely that you have encountered him many times. But, God does not force the seed of faith to grow. He does not make you respond. Instead, day after day, we have the opportunity to walk in faith, responding to God’s call. As we do, the seed of faith grows and sprouts. The work of sainthood happens, not in an instant, but in the everyday moments.